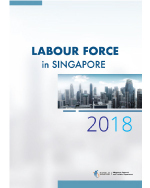 The Report on Labour Force in Singapore is a key report on Singapore’s labour market. It analyses the employment, unemployment, incomes, and working hours of the Singapore population. Insights presented in this Report are based on data collected from the Comprehensive Labour Force Survey. Over the years, the information has helped individuals, businesses and policy-makers understand the shifts in our labour market in greater detail, and formulate policies and programmes to help improve the well-being of workers. An advance report was earlier published in end Nov 2018. For key findings, please refer to the highlights of the report.